Who or what is Inle´? In 1974, Richard Adam’s wrote the beloved classic “Watership Down”. It is a tale about overcoming the obstacles of life that try to beat you into submission and coming out on top, told through the unlikely embodiment of rabbits. Upon reading the book at a young age, one particular thread stood out to me. 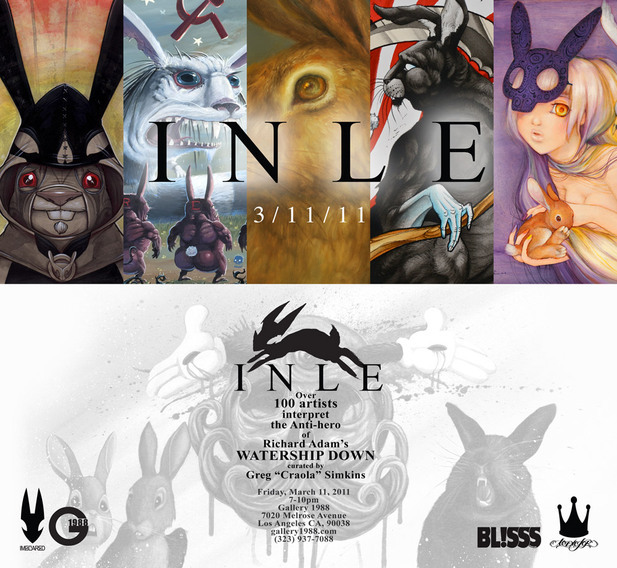 The story of “The Black Rabbit of Inle´. It was on page 280 of this book that my Grandfather had gotten for me on a road trip that the story of Inle´ unfolds. The fear he induced in the rabbits who told tales of him is not much unlike our own fears of death and what is unknown. I always questioned was their fear based upon him or the inevitability of their own demise, and was it something to fear or welcome after a long life lived? With this book began my over 24 year obsession with using rabbits as a tool in my art. Upon relating my memories of this book with some artist friends of mine, I wasn’t surprised to find they had similar attachments to the story and subsequent movie and that it too was a huge influence on their work. The question is asked over and over “what inspires you and your art?”. Well here is one aspect, and In my attempt to keep this story alive and in honor of Richard Adam’s timeless story we are proud to present “INLE”.